Freema Agyeman, Nicholas Briggs and Debbie Chazen are the readers of these eight original stories featuring the Tenth Doctor and Martha, as played on TV by David Tennant and Freema Agyeman. 'The Story of Martha' by Dan Abnett. Read by Freema Agyeman. 'The Weeping' by David Roden. Read by Freema Agyeman. 'The Frozen Wastes' by Robert Shearman. Read by Freema Agyeman. Based on the hit BBC TV series. Doctor Who theme music composed by Ron Grainer and arranged by Murray Gold. TARDIS sound effect composed by Brian Hodgson. 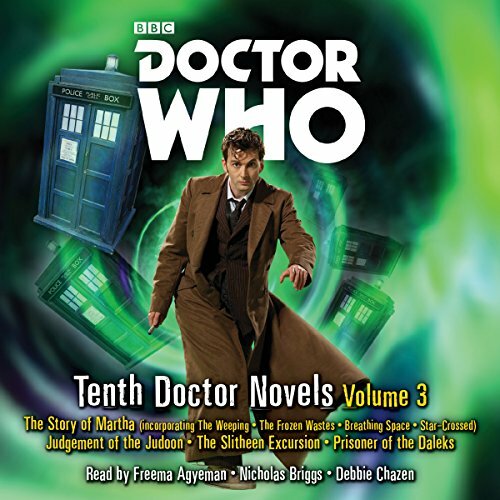 Don't waste a credit buying this audiobook if you have listened to "Judgement of the Judoon", "The Slitheen Excursion", or "Prisoner of the Daleks." "The Story of Martha" is terrible. It's 4 hour long stories that barely have any plot, character development, or even the Doctor himself. He's in one scene only in the first story. It's read by Freema Agyeman, and while she kinda bores me, she does do a good job. But man, I was waiting for it to finish so I could move onto the longer stories, only to find out that I already listened to Judgement of the Judoon (which is really good!). So I wasted a credit on a terrible Martha story, to listen to stories I've already heard and I really don't like the Slitheen as a villain in general so I paid a full credit for one short story. Definitely not worth it in my option. But, if you haven't heard these 3 stories, and you can sit through the story of Martha then it could be worth it as you would spend a credit each on those three stories separately. But still, I would steer away from this audiobook. There are plenty of other audiobooks that are way better. ... for just one Audible token. Great value for a good price. In this collection are several stories bringing to our attention the adventures Martha encounters while the Doctor is the Master's captive and also after he he freed. I needed time to listen in and appreciate the different events, species and time the Docoor encounters but it was worth it. Regarding the narrators: The producers found a a wonderful potpourri of them, I really enjoyed listening to their vocies. Looking forward to the new Box 😊.